More interesting ones to come in Part 10!…. Myospherulosis is an uncommon foreign body reaction that occurs in tissues exposed to antibiotic and oil-based ointments. Characterised by the presence of sac like structures containing spherules which give the appearance of partly filled bag of marbles. Tadpole cells in squamous cell carcinoma( source ) Tadpole cells in squamous cell carcinoma these cells are Elongated and club shaped. These cells have broad end which tapers to narrow end and has hyperchromatic nucleus with dense keratinized cytoplasm, which looks like a tadpole. sometimes also seen in Rhabdomyoblastoma, where these cells are called as strap cells/tadpole cells. Swarm: a group of honey bee that emigrate from hive and fly off to start a new colony OR bees settled in a hive. 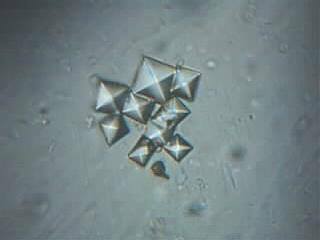 Swarm of bees in alopecia areata is used to desctibe hair bulbs in alopecia areata which are diffusely infiltrated by discrete clusters of lymphocytes. Also referred to as lymphocytes buzzing in peribulbar region appearance. This is seen in Acute stage of Alopecia areata. Vermont foliage appeareance of hyperkeratosis ( source ) Vermont is a state in the New England region of the northeastern United State. Vermont foliage appeareance of hyperkeratosis in cervicovaginal smears of pap smears. Presence of numerous anucleate appearance in pap smears of hyperkeratotic lesion, resembles that of foliage in vermont. Flask-shaped ulcer of intestinal amebiasis. ( source ) Flask-shaped ulcer of intestinal amebiasis. Caused by E histolytica, Amebic lesions begin as small foci of necrosis that progress to ulcers. Cart wheel nucleus of Plasma cells. ( source ) Cart wheel nucleus of Plasma cells. They have basophilic cytoplasm and an eccentric nucleus. The nucleus with heterochromatin is in a characteristic cartwheel or clock face arrangement. Fibrous dysplasia (FD) of bone is an uncommon disease caused by sporadic, congenital mutations in the cAMP regulating protein, Gsα. 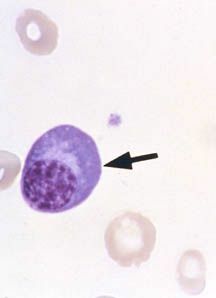 The organisms are seen within the cytoplasm of histiocytes from the smear taken from the ulcer.. The bacteria are ovoid or bean-shaped varying in size from 1 to 1.5 pm in length and 0.5 to 0.7 pm in thickness. 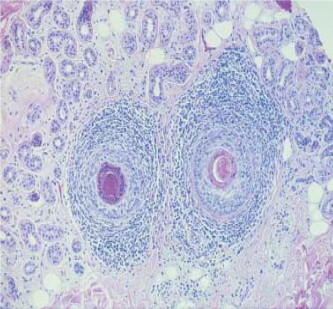 When stained by Giemsa, they have blue chromatin inclusions at each pole/bipolar staining which gives the characteristic ‘closed safety-pin’ appearance. Monohydrate: dumbbell, ovoid, or rectangular in shape. Major component of renal calculi.